Deadline to submit applications is May 5th 2019. A new post doc opportunity to model climate change impacts on the Northeast U.S. marine ecosystem using Atlantis. The position can be located at the email vincent.saba with any questions. Thanks in advance for spreading the word throughout your networks! The NOAA Northeast Fisheries Science Center is seeking a Post-Doctoral Research Associate at either the Woods Hole, MA lab or Narragansett, RI lab. A Ph.D. is required for this position. Applicants should have a background in: 1) marine science or fisheries science, 2) ecosystem or population modeling, 3) model coding (R, Matlab, etc.). Experience with end-to-end ecosystem models like Atlantis is desired but not required. This project will fund a fulltime NRC post-doc that will focus on climate simulations (hindcast and projection) of the Northeast U.S. version of the Atlantis end-to-end ecosystem model. Project Background: In order for the NEFSC to fully assess the impacts of historical and future climate change on the entire U.S. Northeast Shelf Large Marine Ecosystem (U.S. NES) from physics to production to human dimensions, we must use an end-to-end ecosystem model such as Atlantis (Fulton et al. 2011). Atlantis is a mechanistic simulation model that includes all components of a marine ecosystem from biophysical variables up through economic and social variables. The research objective is to use a new, ROMS (regional ocean modelling system) linked version of Atlantis and force it with a new biophysical hindcast of ROMS-COBALT (ROMS with biogeochemistry; Zhang et al. 2018) as well as two high-resolution climate change projections from GFDL’s global climate model CM2.6 (Saba et al. 2016) and the ROMS-COBALT projection under the high emission scenario RCP8.5. These objectives will allow both the validation of the improved Atlantis model (hindcast) and the assessment of multiple, future management strategy scenarios under a changing climate in the Atlantis projections. 1) Couple the Atlantis ecosystem model to output of ocean and biogeochemical forcing variables from the ROMS-COBALT hindcast that runs from 1981-2015 (Zhang et al, 2018). The ROMS-COBALT hindcast will be converted to the same horizontal and vertical spatial scale as Atlantis. The forcing variables will include physics (i.e. ocean temperature, salinity, and circulation) and biogeochemistry (i.e. pH, dissolved oxygen, phytoplankton, and zooplankton). This coupling will result in a hindcast of Atlantis for the U.S. NES from 1981-2015. We will then validate the Atlantis hindcast using observations (i.e. trawl survey data). 2) Couple the Atlantis ecosystem model to output from CM2.6 (Saba et al. 2016) and a new ROMS-COBALT projection that was run under the IPCC’s AR5 high-emissions scenario RCP8.5. This ROMS daily run includes both physics and biogeochemistry for the years 2055-2085. This coupling will result in a state of the art climate change projection of Atlantis for the U.S. NES. French Research Institute for Exploitation of the Sea, Ifremer, through its research work and expert advice, contributes to knowledge of the oceans and their resources, to monitoring of marine and coastal environments and to the sustainable development of marine activities. To these ends, Ifremer conceives and operates tools for observation, experimentation and monitoring, and manage the oceanographic databases. Created in 1984, Ifremer is a French public institute of an industrial and commercial nature. It is supervised jointly by the Ministry of Higher Education and Research and the Ministry of the Environment, Energy and Marine Affairs. Ifremer undertakes research missions, offers expert advice and acts as a funding agency. Ifremer performs targeted applied research to address the questions posed by society (climate change effects, marine biodiversity, pollution prevention, seafood quality etc.). Results include scientific knowledge, technological innovations, and systems for ocean observation and exploration. Partnerships may be public, private or a combination of the two. Ifremer works in a network with the French scientific community, also collaborating with international partner organizations, in the frame of several national and international projects, including contractual activities. DYNECO (Dynamics of Coastal Ecosystems) research unit is part of the ODE « Oceanography and Ecosystems Dynamic » Department. Its main objective is to study how coastal ecosystems respond to anthropogenic or natural pressures. DYNECO conducts scientific activities and expert assessments in this field. DYNECO strategy relies on the analysis of physical, biogeochemical, and biological processes and is based on experimentations, in-situ observations and modelling. The main research areas are related to: i) dissolved and particulate matter fluxes within marine coastal ecosystems, ii) diversity and functioning of ecological communities and of their habitats, iii) perturbations at the population scales. Within DYNECO, the Coastal Benthic Ecology Laboratory (LEBCO) focuses on the explanation of structures and associated functionalities of benthic coastal ecosystems and the Pelagic Ecology Laboratory (PELAGOS) deals with biogeochemical fluxes, dynamics and functional diversity of plankton communities, with special interest in toxic microalgae, in response to anthropogenic pressures. Numerical ecology has been developing to test and apply theories in ecology and help analyzing complex datasets made of heterogeneous data, e.g. remote sensing, monitoring surveys, outputs of mathematical models, meteorological and climatic drivers, molecular ecology, etc. Applications deal with ecological niche, changes in spatial distribution, phenology of target species and long-term changes of communities in relation to global change. As a numerical ecologist, the scientist will work in collaboration with DYNECO benthos and plankton ecologists to address these scientific issues along the lines of DYNECO research roadmap and the new Ifremer strategic plan. The scientist will contribute to a better understanding and assessment of ecological changes. By developing and applying innovative statistical tools and using data collected within Ifremer monitoring surveys and scientific projects, he/she will address key ecological questions in the context of global change and ecological forecasting. Develop and prospect new statistical methods and tools of interest for applications in marine ecology, e.g. deep learning methods. To carry out these tasks, he/she write proposals, participate to research projects and (co-) supervise Master students, PhD students and post-doctoral scientists in collaboration with DYNECO ecologists. He/she will develop national and international collaborations and communicate his findings by writing papers in international scientific journals and presenting his results in international conferences. He will contribute to Ifremer support of public policy through his expertise in his field of research. External collaborative relationship : national and international collaborations with Universities, Research Institutes and groups of research involved in numerical ecology. PhD in Ecology or Statistics with strong experience in numerical ecology. – Good English writing and speaking skills. – Scientific rigor, organizational and communication skills. All applications are processed exclusively via our website. Interested candidates can apply by clicking the “Apply” button. http://resourcemodeling.org/wp-content/uploads/2015/05/logo_small_inverted-300x129.png 0 0 rma http://resourcemodeling.org/wp-content/uploads/2015/05/logo_small_inverted-300x129.png rma2019-01-23 21:36:472019-01-23 21:39:06Post-doc "Performance of water supply services and multi-objective asset management: contribution of the cost-benefit analysis"
I wish you a very happy new year 2019. 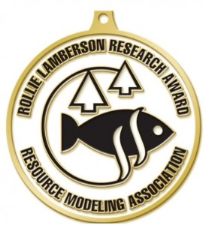 The Rollie Lamberson Award celebrates the contribution of Professor Emeritus Rollie Lamberson to the field of natural resource modeling and the growth of the Resource Modeling Association by recognizing each year an outstanding paper in natural resource modeling in the previous two years. See http://resourcemodeling.org/lamberson/ or below for more details. All papers published in journal Natural Resource Modeling during the previous two calendar years (namely 2017-2018) will be considered automatically provided at least one of the authors is a current member. a nominating letter specifying why the paper is deserving of the Rollie Lamberson Award. Send me your nominations <luc.doyen@u-bordeaux.fr> or to RMA contact http://resourcemodeling.org/contact_us/. The submission for the 2019 award will be closed on January 31, 2019.